Hungry for a hearty morning meal? 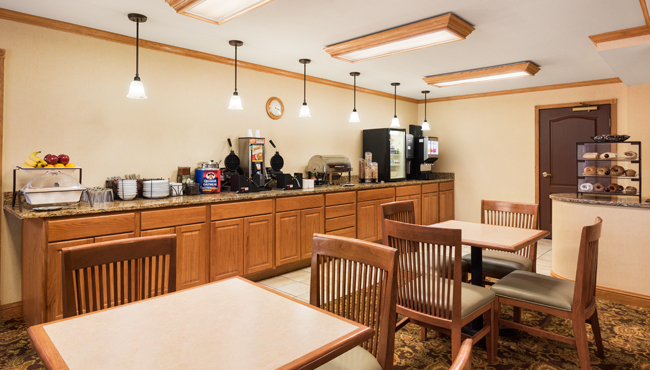 The Country Inn & Suites in Monona offers a complimentary, hot breakfast, featuring many of your hot and cold favorites. Cut into a fresh-made Belgian waffle dripping with syrup, or top a bowl of cold cereal with fresh fruit. Don’t forget to save room for biscuits and gravy, sausage or scrambled eggs. Plenty of hot coffee is available, too. For lunch or dinner, head out to nearby restaurants like Fat Jacks or Swad to eat like a local.